Happy Easter Everyone! 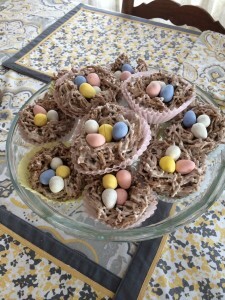 As it is now my newest tradition (2 years running), I made my High Fiber Nests again for the holiday. Last year I was pregnant and obsessed with Fiber. These treats were so so good and good for my fiber intake..so I decided to make them a Lewis Tradition. The “recipe” is a cinch. Take the first 3 ingredients in a pot on low heat…let them melt. 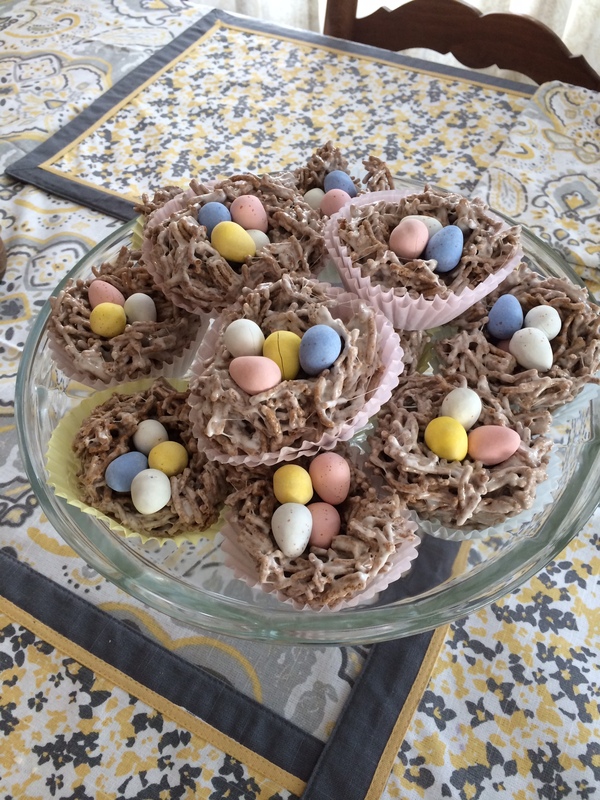 Stir in your cereal……..spoonful into cupcake tins…and press down the center to make look like a nest. You may need to keep wetting your spoon so it doesn’t keep sticking. Then you can place your eggs in each nest…3 or 4 should do. 🙂 Super cute and YUMMY!!! Looks like a real nest!!! Happy Easter!!! As a new Mom, I am constantly trying out new products for either me or my little guy. Products that are high in quality, but easy on the purse strings. Sometimes, things are just worth the extra buck…but more often than not, you can find a comparable or even superior product for far less money. Also, as an older Mom, there are certain things that make my life sooo much easier. And one’s that really don’t. So it’s my 2 cents! That is the purpose of this little corner of my blog. If you have any “Must Haves” or “I Can’t Do Withouts” let me know!! We mamas have to give each other a hand…or at least a tip every now and then! Pandora – Rock-a-bye-Baby Station. Its fantastic! I can’t even describe it. Just check it out! The Mombo Nursing Pillow! So I don’t use it to “nurse” per say, but I use it at every bottle feeding. It saves my back, my arms, you name it. It fits around the front of my waist, I plop down on any chair and I have instant support. And O is more comfortable. Even Ian loves it. Some people like the Boppy…I’m sure it just as good. But the Mombo has a firm side and a softer side. The Boppy is a little too floppy for my liking. The cover comes with it and is super easy to wash. There is a vibrating device you can put in to “sooth” your LO, but I’ve never used it. Graco Pack and Play with changing table. I had two levels and a huge staircase when I had O. This changing table attached to the pack and play saved me from running up and down the stairs with him every time he had a wet diaper. Which was A LOT! Saved my old back for sure! He could also nap in it and it was a safe place for me to put him if I needed to do something on the lower level other than hold him. It also had a diaper caddy that attaches to the side for all your wipes, ointments, powder and of course, diapers. It came with a bassinet, but we never used it. O slept in his crib from day one. I suggest my “must have” to bring the child and be sure her hips are in the correct position and not dangling! perfect even when they are a little more grown up, more and if not heavy!